As we’ve been saying from the word go, if BAC can jump the 13.50 hurdle, we’ll be looking to roll up our strike price, and today might very well be the day it occurs. The stock traded as high as 13.48 in post-market trading yesterday, and the markets in general appear to be in line for another solid session. To remain interested in our ideas going forward, we’ll need to see BAC hold support above 13.15 on any pullbacks. Mobileye N.V. (MBLY) – We’re having such good fortune in options with current conditions allowing for the type of volatility that traders dream of, that we might as well offer up yet another new idea this morning. We’re going to be paying attention to the MBLY Weekly $44.50-46.50 Calls, as the stock is gapping up heavily in the premarket today. We’re also taking a technical interest in CETX this morning. As you can see on the following chart snapshot, there are a number factors indicating the potential for some increased upward movement. This comes just a week after the company announced its first ever share buyback program, which will allow for the repurchase of up to a million shares over the next year. We entered VGZ into the mix in Friday morning’s premarket report after it became clear that it would be a troubling session for currencies in the wake of the Brexit vote. 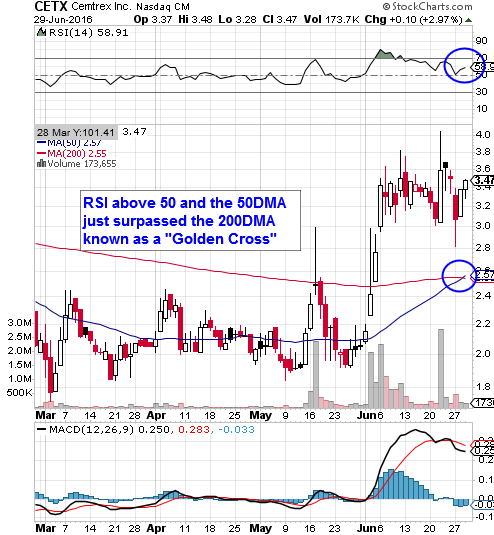 It was among a list of gold-related stocks that we wanted to track, and VGZ has set itself apart from the bunch. From our observed low of 1.35 from Friday, yesterday’s high of 2.09 represented a respectable session-over-session upswing of 55%, so congratulations to anyone who took a piece of the pie during a time when big gainers have been relatively difficult to come by. With the markets appearing to be gearing up for a rebound today, we’ll want to keep an eye out for a gap-down and consolidation from VGZ. We’ll only remain interested if it maintains support above its recent swing high around 1.50. We also need to update folks on our NEWC reminder from yesterday’s report. It was a combination momentum/news play and the stock continued to set new highs. From a low of .0179 it ran 35% intraday to .0241 on reasonably high volume to the tune of three times the monthly average. The company put out another PR today, and will hold our attention as long as it continues to exhibit momentum-play characteristics. This is a stock that we haven’t crossed paths with in more than a year, but we noticed the beginnings of a nice rebound off of recent relative lows, and wanted to tag it for observation. It has a ripe looking chart, and there is still a good sized gap that remains to be filled. We’ll have this play on our radar for that possibility moving forward. 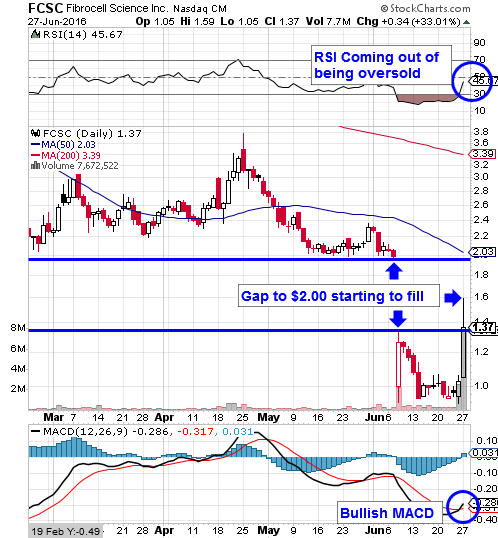 We most recently alerted this one as a bottom play in our watchlist on Tuesday June 14th, and subsequent to that, the stock was trading as low as .0015. Yesterday ADTM broke out off its bottom, catching some nice momentum running as high as .0033, for a move of 120% in just two weeks’ time! BAC is among those stocks that took a Brexit-based pounding in recent sessions, and it appears to want to rebound a bit today. As long as this market reversal doesn’t turn out to be a head-fake, we’re going to want to pay attention to a couple set of contracts in the BAC options chain. Our possible strike points will be the BAC Weekly $12.50 and $13 Calls. If it can surpass the 13.50 mark, we’ll look to roll up our strike price a level or two.